The scope and method of logic as we know it today eminently reflect the ground-breaking developments of set theory and the logical foundations of mathematics at the turn of the 20th century. Unfortunately, little effort has been made to understand the idiosyncrasies of the philosophical context that led to these tremendous innovations in the 19thcentury beyond what is found in the works of mathematicians such as Frege, Hilbert, and Russell. This constitutes a monumental gap in our understanding of the central influences that shaped 19th-century thought, from Kant to Russell, and that helped to create the conditions in which analytic philosophy could emerge. 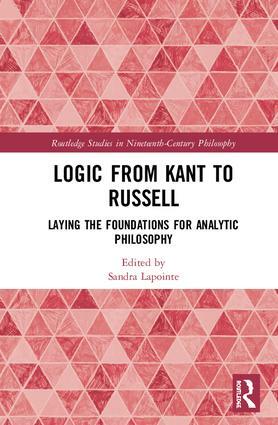 The aim of Logic from Kant to Russell is to document the development of logic in the works of 19th-century philosophers. It contains thirteen original essays written by authors from a broad range of backgrounds—intellectual historians, historians of idealism, philosophers of science, and historians of logic and analytic philosophy. These essays question the standard narratives of analytic philosophy’s past and address concerns that are relevant to the contemporary philosophical study of language, mind, and cognition. The book covers a broad range of influential thinkers in 19th-century philosophy and analytic philosophy, including Kant, Bolzano, Hegel, Herbart, Lotze, the British Algebraists and Idealists, Moore, Russell, the Neo-Kantians, and Frege. Sandra Lapointe is Associate Professor in the Philosophy Department and Research Affiliate of the Bertrand Russell Research Centre at McMaster University. She is a Commonwealth alumna and a Fellow of the Humboldt Foundation. She works on 19th and 20th century philosophy of logic, language and mind. Her most recent publications include Philosophy of Mind in the 19th Century (ed., Routledge 2018) and Innovations in the History of Analytical Philosophy (eds. with Christopher Pincock, 2017).